I've been looking for interesting lights to use at night. I wanted something colorful, not too distracting, and ideally, portable. I bought 3 Oggz, a Laserpod, and a Mathmos Color Bubble. You can't adjust the color changing. It would've been nice to have a way to pause it, so that you could keep it at a certain color. The switch at the bottom is not easy to turn on in the dark. I used the Oggz as nightlights for a while, and until you turn them on you can't see the switch, which you need for turning them on. The red light is much darker than the green and blue. This means the overall brightness changes, not just the color. 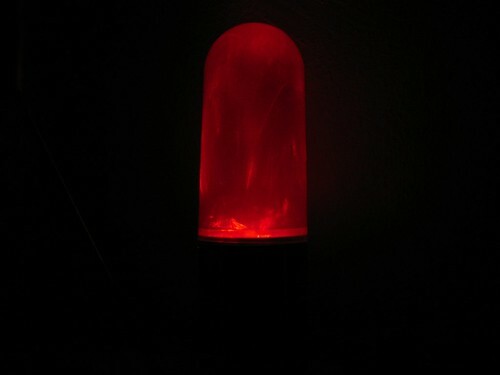 This is especially unwelcome when you're using it as a nightlight, because your eyes adjust to the blue and green brightness, and then you get plunged into darkness when it cycles to red. Despite these minor problems, I do like the Oggz. Uncovered, the Laserpod will project lights onto the ceiling. It's not bright enough to see except at night with all the lights off. Covered, the Laserpod will project lights onto a frosted dome (it comes with two, one tall and one short). When covered it's easier to see the patterns. Red light only, you will get the laser beam, which is either bright points or laser lines. You can also turn on blue LEDs to add to the ambience, but they don't project any sharp patterns. There is no mode to use the blue LEDs without the red laser. Unfiltered, the Laserpod will project its laser as points onto the ceiling or one of the covers. It's more interesting to use the diffraction crystal, which will turn the points into cool patterns. You can also use your own objects; I tried a small crystal I have and was able to split the laser points into lots of dots moving around on the ceiling. Pictured is the Laserpod with only the red laser on, the diffraction crystal, and the tall cover. That's my favorite of the many ways of using it. Unfortunately the motor can be loud at times, so I can't leave this on at night when going to sleep, and it's dark enough that it's not really useful to leave this on during the day or in the evening with other lights on. So I find that I rarely ever have an occasion to use it. For the high price, the noise, and the lack of brightness, I cannot recommend the Laserpod. I don't have a picture of this, but you can see one at ThinkGeek. I was hoping for something that addressed the flaws of the Oggz. The Mathmos bubble can be turned on or off with just a squeeze, according to the product literature. However, it's a bit tougher than that because the squeeze has to be on a particular side of the sphere. Given that spheres have no sides, it becomes hard to find the right place when it's dark. 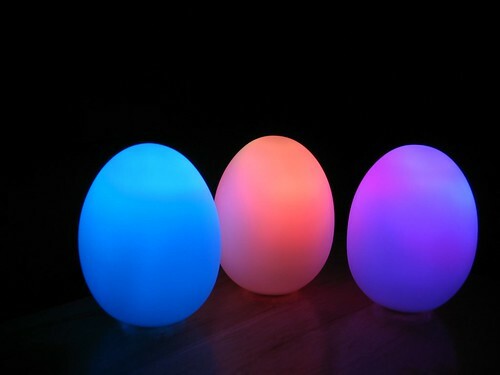 It's always blue, not changing colors or brightness, so it's a better nightlight than the Oggz. Unlike the Oggz, which can be recharged simply by putting them down, the Mathmos has to be plugged in with a special cable. The Mathmos has a nice soft feel like the Oggz, but it's significantly heavier. The Oggz are light enough and feel durable enough that I am comfortable throwing them across the room; the Mathmos is heavy enough that I won't play with it the same way. I like the Oggz most of all. They're much cheaper than the Mathmos and there are three of them, not just one. The egg shape is a little nicer than a sphere. The Laserpod is the most expensive of all, and after the initial coolness wore off, it just hasn't been enjoyable. I recommend the Oggz.